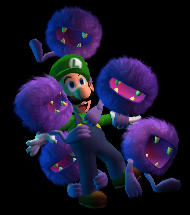 Fuzzballs are purple creatures that appear in Luigi's Mansion: Dark Moon. They are only found in the Secret Mine's Chalet. These creatures cannot damage Luigi on contact or via attacks. Instead, they chase Luigi around and get in the way of the Poltergust 5000. If Luigi picks one up using it, he can shoot it around the room and stun it for a short time, similar to the Poinks from Super Mario Sunshine. They appear at the end of the first mission, Cold Case. There are also Gold Fuzzballs that drop gold bars and bills when thrown. These turn into the normal purple versions after being thrown around three times. ↑ 1.0 1.1 von Esmarch, Nick. 2013. Luigi's Mansion: Dark Moon Prima Games Official Game Guide, page 161. This page was last edited on March 4, 2018, at 09:29.